We have now completed the first 12 days of the 2019 General Assembly Session, and the legislative train has clearly begun to pick up speed. But not everything is on the same track. The big developments last week included election of a State Corporation Commission judge, defeat of a dozen common-sense gun bills, passage of the ERA amendment by the Senate, and introduction of a major bill to fight climate change. The State Corporation Commission (SCC), a constitutional creation separate from the executive and legislative branches, is one of the most important entities of our state government. It is distinctly different than similar commissions in other states because it has a broader regulatory charge; it not only regulates railroads and utility rates, but also approves health insurance rates and oversees a wide variety of other areas important to consumers. The General Assembly selects the three members of the Commission, and the Governor has no veto power to deny their seating. Under the Virginia Constitution, at least one of the three Commissioners must also meet the qualifications to be a judge, and last year that Commissioner retired before his term had expired; but the Republicans in the House and Senate have not been able to agree on a new appointment to replace him for over a year—until last week. In a surprise and shocking move, at the speed of a “bullet train” and with little notice to the General Assembly or the public, the Republicans approved a new Commissioner within 24 hours of her announced candidacy. Judge Patricia West, most recently an associate dean and professor at Regent University Law School and previously Virginia Secretary of Public Safety for Governor George Allen and chief deputy attorney general to former Attorney General Ken Cuccinelli, admitted in her abbreviated hearing before the Commerce and Labor Committee that she has absolutely no experience in health or energy regulatory policy, key issues before the Commission. The public had no opportunity to comment on the choice, and very few General Assembly members had a chance to actually speak with the candidate, as is the typical protocol prior to approval. You can see my comments on the nomination here and can read the story about the appointment in the Washington Post. I hope that Judge West will be a good Commissioner, but the term she is completing for her retired predecessor ends next year, so she will need to be considered for a full-term appointment in 2020, after the fall elections. On Thursday afternoon, over a dozen common-sense gun safety measures were killed in the space of a few hours by a subcommittee of the House Committee on Militia, Police, and Public Safety.Two of those bills were mine. This Subcommittee is controlled by rural, conservative Republicans who never support reasonable gun safety measures, so their opposition was not surprising. The first of my bills (HB1956)would have allowed localities to control whether firearms can be carried in public spaces at permitted events. This measure, which had the full support of Attorney General Mark Herring, was important in the aftermath of Charlottesville, August 2017; if you walked the streets of the city on that day, you saw countless people with automatic weapons dressed in fatigues, and no one knew who they were, or why they were heavily armed, or what they might do with such weapons. As it did last year when I first introduced it, the bill died with all 4 Republicans voting against it. 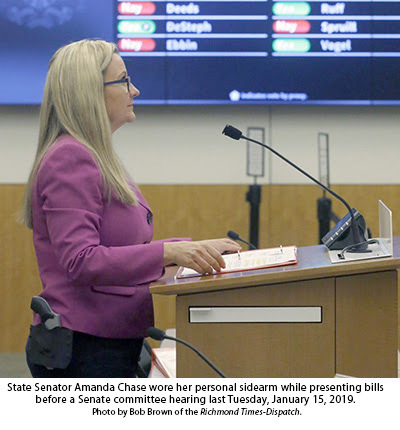 My second bill (HB1957) would permit judges to inquire as to whether any firearms in a home where children are experiencing a mental health crisis were secured. It died as well, as did a bill to enact universal background checks, another to restore the previous statute that prohibited Virginians from purchasing more than one gun a month, and a relatively new idea that has gotten support within Republican-controlled legislatures around the country called a “Risk Warrant.” Under this approach, after a judicial process, a person’s firearms could be temporarily removed from his or her home if it can be shown that the person is a danger to self or others; the firearms would be returned after the crisis subsided. This past week, my friend and fellow Delegate John Bell and his family suffered a terrible losswith the death of their son and brother. Joshua Bell served this nation in the Air National Guard, and continued to serve in a different way when he shared his powerful personal experience of injury and subsequent addiction to pain medications with others, including his father (whose legislative agenda has included many bills dedicated to helping those caught up in opioid addiction). Our colleague Mike Mullin movingly eulogized Josh’s death with the words that such a tragedy “smothers our souls.” Our hearts grieve for John, Margaret, and their family. 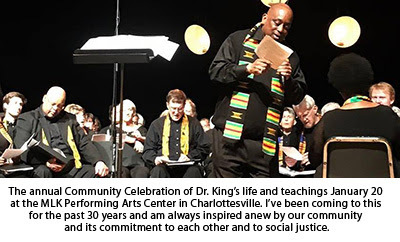 On Sunday, I joined hundreds at the ML King, Jr. Performing Arts Center to celebrate the legacy of Dr. Martin Luther King, Jr. We heard wonderful musical performances from the interracial community chorus and a powerful, inspiring speech from Dr. Cornell Brooks of Harvard University. It was wonderful to see a lifelong Charlottesville volunteer and advocate, my good friend Teresa Price, receive the annual Martin Luther King, Jr. Community Award. In honor of Dr. King, I have republished a speech I made last year at the General Assembly’s prayer breakfast, where I discussed the significance of the “Letter from a Birmingham Jail.” You can view it here.